Featuring Dr. Stephanie Covington, an expert in gender-responsive treatment, this program helps female clients tackle some of the challenges of working the 12 steps specifically as they relate to the female experience. The video begins with an introduction to the program and is followed by Dr. Covington leading real women in recovery through discussions and exercises. The client book explores the uniquely female experiences that have shaped women and how they approach recovery from addiction to alcohol and other drugs. 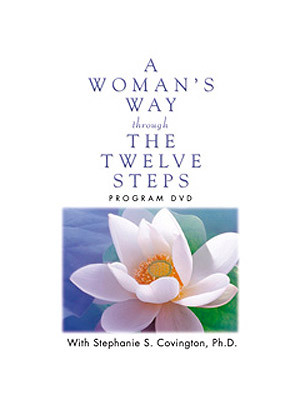 Dr. Covington illuminates how each of the Twelve Steps speaks to a woman’s experience and offers inspiring stories of real women who have traveled through the Steps. The workbook helps deepen and extend the understanding of the lessons taught in the book and brings them to life with simple exercises and journaling activities. It further empowers each woman to take ownership of her recovery by documenting her growth and recovery process in a personally meaningful way. Dr. Covington guides women to reinterpret the Steps to support their own recovery. The facilitator’s guide offers practical guidance to deliver this program, which includes a thirteen-session curriculum of experiential exercises. It describes the most effective ways to conduct sessions with clients, including when and how to use the program’s book, workbook, and DVD, along with special instructions on how to adapt the content for girls. The Complete Curriculum set in English includes DVD, Facilitator’s Guide, 10 Softcover Books, 10 Workbooks, at $495. The DVD by itself is also available as a stand-alone item to enhance your existing program, at $225. Contact our offices to order. English Softcover Books (at $16/each) and English Workbooks (at $15/each) are also available for purchase individually. Contact our offices to order Spanish books. Contact our offices to order English books. Spanish Translation Softcover Books (at $15/each) and Spanish Workbooks (at $13/each) are also available for purchase individually. Contact our offices to order Spanish books.